Across Oregon and Washington, more than 600,000 acres of forestland are certified as “well managed” by the standards of the Forest Stewardship Council® (FSC®). And yet, much of the wood harvested from these forests doesn’t make it to the consumer with its certification intact. In many cases, these logs are sold into the generic wood market and don’t receive any special recognition when turned into lumber, plywood, or furniture. 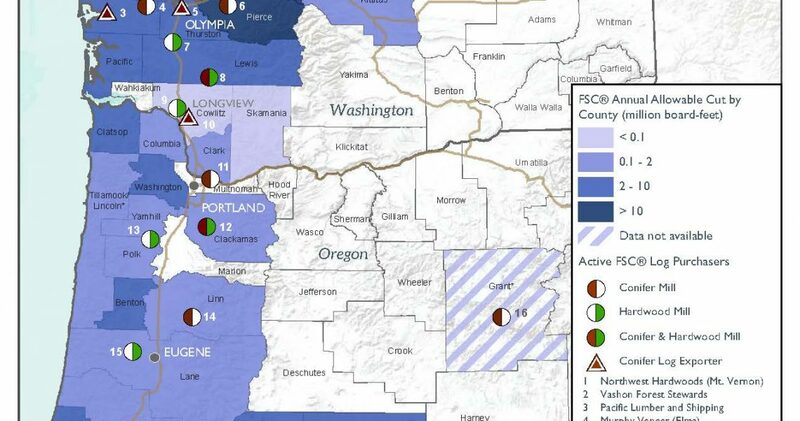 For NNRG, with our 190,000-acre group certificate that now covers a larger area than any other in the Pacific Northwest, that is a grave disappointment, and it affects about 90 percent of the timber harvested by the members of our group. For certification to thrive, we believe, the products must reach their end-user still marked with the distinction of having come from forests where important values such as water quality, wildlife habitat, and workers’ rights are protected. As a result, we have embarked on a bundle of projects to better understand and strengthen the FSC ecosystem. We reported on one of those in March when we released a map of the FSC-certified forests across our two-state region, depicting the approximate locations and sizes of the certified properties. Next, we wanted to see how the wood from those forests could reach the market. So we set out to determine how much timber is available annually in each county from FSC-certified forests under FSC’s sustained-yield principles. Simultaneously, we mapped where it could be bought by mills or export docks that track the certification of FSC logs and pass it along to the next stage in the supply chain, be it a lumberyard, plywood factory, pulp mill, or door-maker. The result was the map above. The shading portrays the amount of FSC-certified timber that could be available annually, on average, from each county in Oregon and Washington. The circles (mills) and triangles (export docks) represent log buyers who are certified for chain-of-custody tracking under FSC rules, and will pass the certification down the chain to their customers. 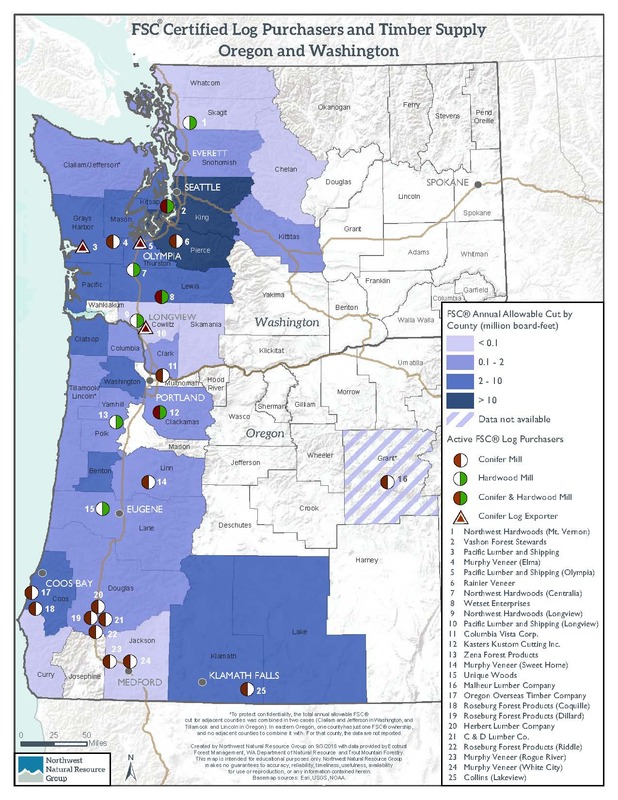 The map reveals an important gap in the markets for FSC logs: the South Puget Sound region of King and Pierce counties offers the greatest concentration of FSC supply, but has just two mills that are FSC-certified—one of them accessible from the mainland only by ferry. We are working to correct this imbalance in collaboration with builders, developers, and partner non-profit organizations such as Ecotrust, Sustainable Northwest, the Washington Environmental Council, and the Forest Stewardship Council itself. In the next phase of our quest to connect people with wood from well-managed forests, we want people to have an easier time sourcing FSC-certified building materials for their projects. So we are developing a searchable database of FSC products in the Pacific Northwest, building on work that was initiated by FSC in a micro-site aimed at the construction trades. That project is in beta testing, and we look forward to rolling it out in the coming months. A PDF of the map is available here. We are indebted to Trout Mountain Forestry and Ecotrust Forest Management for sharing proprietary information and trusting us to combine data from adjacent counties, where necessary, to protect their confidentiality.